There is nothing better than a vacation. It gives you time to relax, recoup and give your body, mind and spirit a little time off from the stressors of everyday life. If you’re planning your next getaway, you could just fork over money to stay at a traditional hotel…or you could take your vacation up a notch with these amazingly unique accommodations that offer you a night that you won’t soon forget. 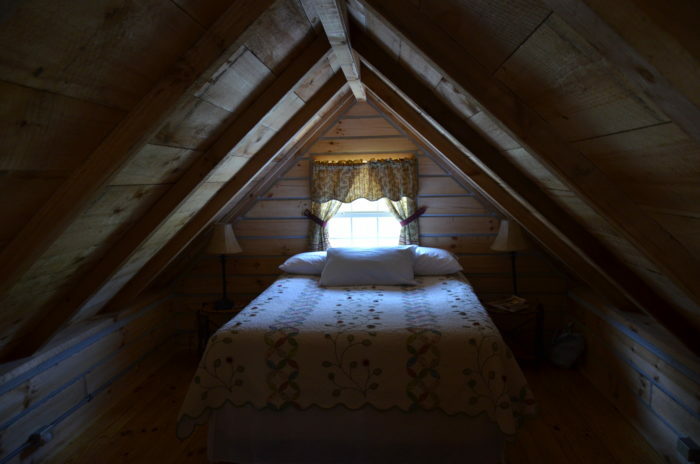 If you think back to your treehouse as a kid and have the fondest of memories, then get ready to relive that moment from your childhood all over again when you stay at Timber Ridge Outpost and Cabins. 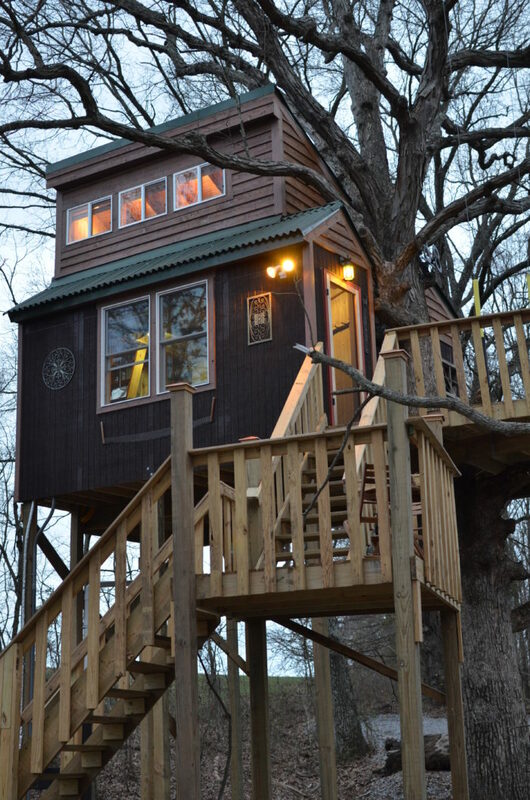 The White Oak Treehouse is nestled within an over 200-year-old tree. Enjoy majestic views while staying 20 feet in the air. It sleeps four to six people, so snag your girlfriends or take the family on a woodland adventure. 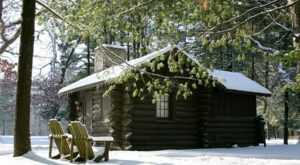 And if you prefer to keep your two feet on the ground, you can also stay in one of their rustic log cabins that boast soothing fireplaces and even a campfire area so that you can make s’mores and tell ghost stories into the wee hours of the night. If you love being on the water and dream of fishing then you’ll truly love being surrounded by abundant forests and beautiful wildlife on these houseboats. 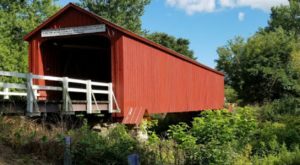 You can bob along peacefully on the river or you can drive along, taking in the beautiful waterfalls and landscapes (a perfect escape during the fall). Cast your fishing line and catch everything from Striper to Catfish. Cook up your fresh catch of the day in their fully equipped kitchens and then watch the sun go down while enjoying your beautiful meal before calling it a night and falling asleep to the tranquil sounds of the water. Do the Roaring '20s call to you? Do you think you were a flapper in a past life? Always wanted to go to a speakeasy? 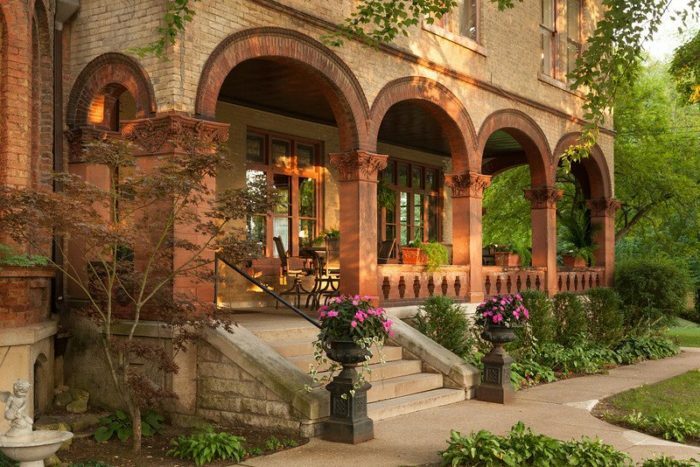 Well, now you can when you stay the night at the Old Chicago Inn in Lincoln Park. When you check in you’ll be given a unique password. While you can get to the Room 13 speakeasy from inside the inn it’s way more fun to go around the outside of the building and knock on the door. Someone will open a peephole and ask for your password. 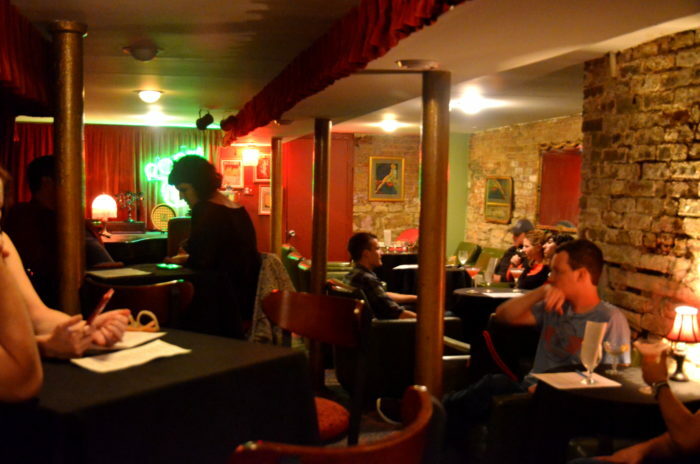 Then you may enter to enjoy decadent libations while listening to live prohibition-era music. So put on your flapper dress on and party like Gatsby before having a peaceful slumber in one of the Inn’s cozy rooms. Once a private estate, this staggeringly glorious inn is the perfect place to celebrate an anniversary or to indulge yourself with a weekend of pampering. 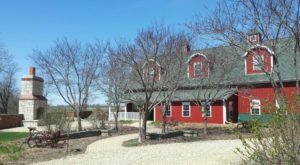 Choose from a quaint private cottage with a whirlpool tub and a fireplace, a deluxe cabin with a divinely rustic country experience, or stay in the main building and enjoy one of their many luxurious suites. Sip a glass of wine while walking along the majestic grounds or take a cooking class from their expert chef. 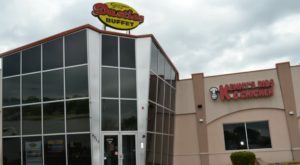 You’ll feel like a brand new person after a weekend here. 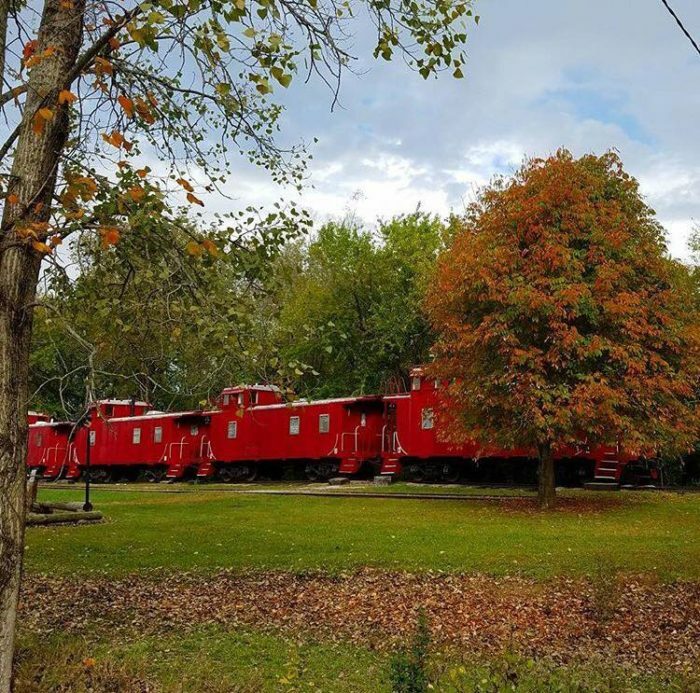 If you aren’t keen on plush bedding and a Jacuzzi tub and think the best vacations are spent in the great outdoors, then you may fancy a night in this fully air-conditioned train caboose located in the Wildlife Prairie Park. Gather up five friends to share in an adventurous weekend between April and October and bunk up together. 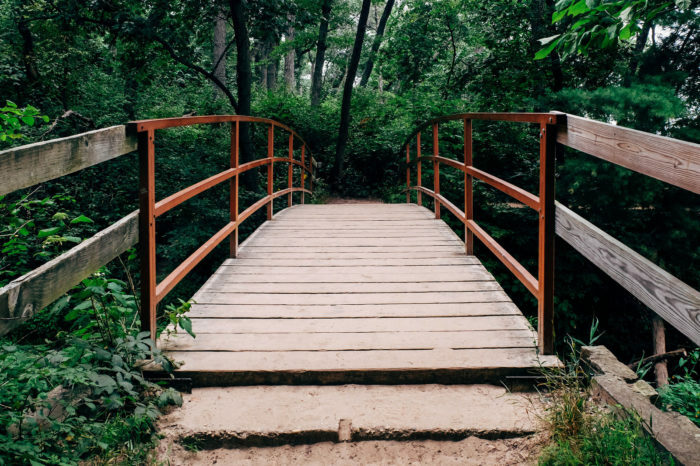 While you’re here, enjoy the over 20 miles of terrain just perfect for mountain biking or hiking. During the warm months you can also take the Wildlife Prairie railroad to take in the beautiful Illinois wildlife. Are you a music buff? Do you love going to concerts? Are you planning to attend the Summer Camp Music Festival next summer? If so, you could deal with trying to find a place to stay nearby or you could enjoy a night in Three Sisters Park (and we don’t mean sleeping on a park bench). 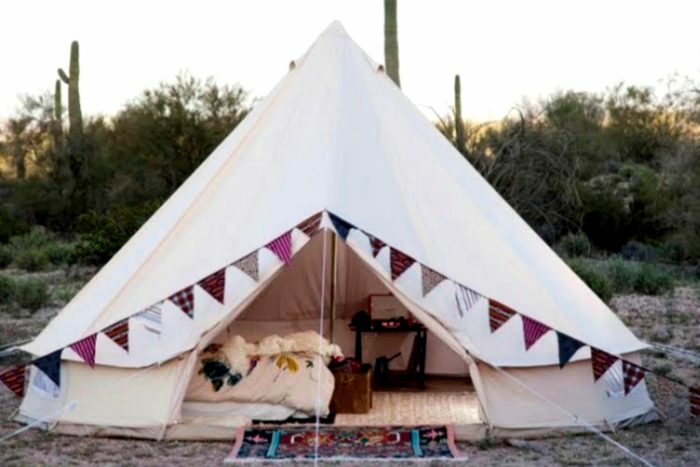 Glamping has become a popular trend for those who maybe don’t want to rough it but still want to be surrounded by the peace and quiet of nature. Choose from the intimate bell tents, which can sleep up to two people, or choose the more spacious safari tent that can sleep up to five. This experience will change the way you feel about camping. Do you often feel like you were born in the wrong era? Do people tell you that you have an old soul? Are you looking for a place to stay that is steeped in history? 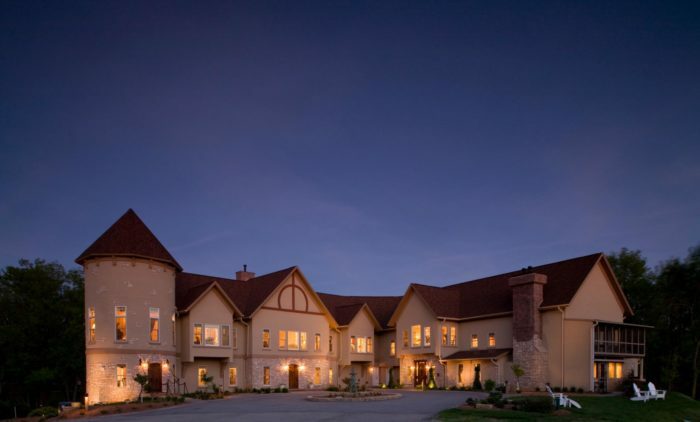 Then what better place to stay than the Vrooman Mansion, a bed and breakfast in Bloomington? 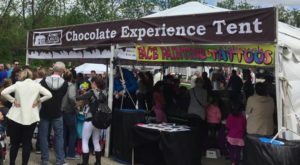 Not only is it close to all the restaurants and shops of the town but also it offers some pretty amazing experiences for its visitors. If Halloween is your favorite holiday, then this is the time to checkout this inn. Every year they host “A Walk in the Past” Victorian Halloween tea. Put on your finest Victorian garb and enjoy savory snacks, sweet treats and an array of teas. You can even add a special package to your stay and enjoy cheese trays, delicious snacks and champagne all from the comfort of your own room. 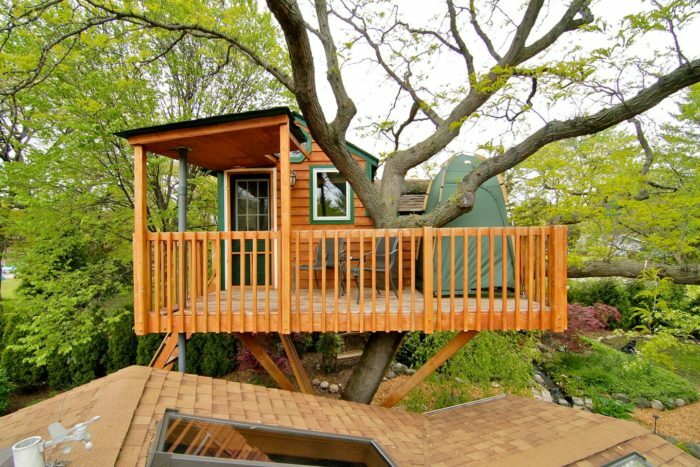 So it seems that there is more than one treehouse to stay in when you visit Illinois (go figure!). Feel like a lost boy for a night and nestle up in this cozy little house in the trees while overlooking a waterfall. Make a bonfire outside the house (just remember to bring the marshmallows) and take a relaxing soak in the hot tub. 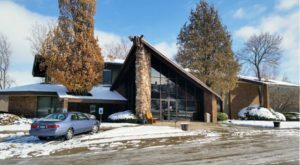 With heating and air conditioning, wireless internet and even an indoor fireplace, you won’t believe how glamorous woodsy accommodations have become. Always dreamed of staying the night in a castle? While it might not be a real castle like the ones you see in Ireland, this is pretty darn spectacular! 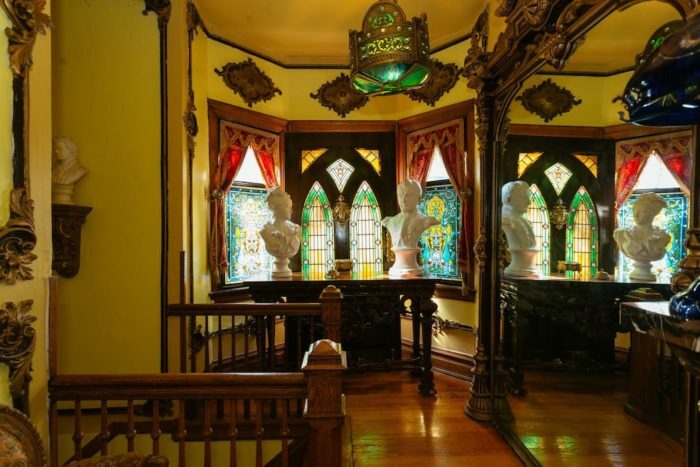 This beautiful Berwyn mansion is a jaw-dropping experience. All you have to do is stand outside this towering home and you’ll be in awe. The outside contains a tree-covered grove to sit with your morning coffee. The stained-glass window turret and the sculptured statues will take your breath away. Inside you’ll enjoy furnishings in Baroque, French and Rococo styles with a generous collection of lavish antiques. 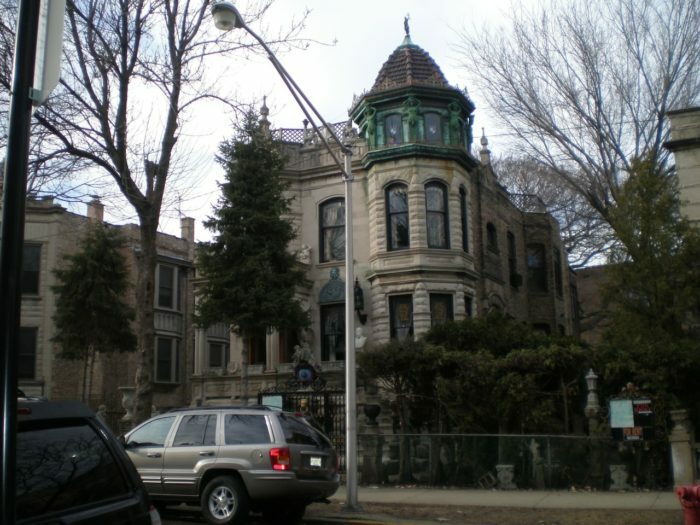 You'll feel like royalty when you stay at this Chicago castle for a night. 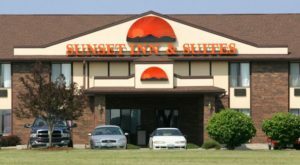 Are there any fascinating or weird lodgings in Illinois that we might have missed but should certainly be on the list? 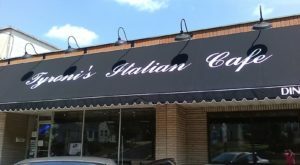 If so, feel free to share your favorite hidden gems in the comments.